Falklands Conservation: Sheep Poop and Native Seeds Can Be a Successful Recipe for Restoration! The Falkland Islands comprise of two main islands and over 700 smaller islands: our total area is 4,700 square miles - around the size of Connecticut in the USA. Our population is 3,500 people, three quarters live in the capital, Stanley and the gnarly remainder live in small settlements and isolated farms. We farm cattle and sheep: extensive sheep farming dominates with over half a million sheep at last count. The Falkland Islands are an exceptional place for wildlife, from spectacular colonies of albatross and penguins to rare plants and insects. There are no native trees or native grazers (except geese), but grasses and shrubs including tussac grass (Poa flabellata) grow up to three metres tall. Seed collecting in native coastal grassland is exciting and sometimes adrenalin-charged! It’s a super habitat - stuffed with insects, it provides food and nesting sites for 30 species of birds, and shelter for fierce sea lions and noisy elephant seals. Carefully managed, these grasslands can also provide grazing and shelter for livestock. Falklands Conservation is a small charity based in Stanley; we work with the local and international community to help conserve this breath-taking natural environment. Our work includes practical conservation projects, monitoring, scientific studies and education (one in five children in the Islands belong to our youth group). Our penguin rehabilitation centre is a hit with visitors but just as important is work with farmers and the tourism industry to support their restoration of native plant habitat, including pioneering work with native seeds. We live in the furious fifties! Strong westerly winds rip at the Falklands, they combine with dry summers to drive soil erosion where ever it gets hold. Peaty topsoil becomes baked and impenetrable, worse it can be lost altogether leaving extensive clay pans. Common causes of erosion are fire, unsuccessful planting and overgrazing. Erosion is a problem, it means a loss of food and shelter for livestock, contamination of wool with soil, and it threatens valuable wildlife habitat. It worked! Plants grew on eroded peat, sand and even clay: three clear winners emerged across all soil types: Fuegian couch grass (Elymus magellanicus), tussac (Poa flabellata) and bluegrass (Poa alopecurus), good stands of these species often helped finer plants to grow. Sowing seed with no ground treatment was useless – plants needed help! Dung was best, dags were ok and matting was just a bit better than nothing. The treatments worked together but none were significantly better than dung alone. Importantly, spicy-smelling cinnamon grass (Hierochloe redolens) proved a slow success; its ability to spread using rhizomes enabled it to escape test patches and to very slowly colonise untreated ground. Hooray for emigration - potentially a long-term soil-saver. Native plant seeds growing on eroded peaty soil treated with sheep manure and dags. Photograph: Falklands Conservation. Now we need to scale-up: at Cape Dolphin Farm a native seed hub is born! This hub is run by the farm and focuses on species which performed well in our trials, it will provide native seed for the farm and small spin-off projects elsewhere. Another trial has placed native plant seeds with livestock to see if hoof action and manure can get them growing. Because manure and wool can contain the seeds of invasive plants we are trying alternatives for areas which are not farmed. On Sealion Island, for example, we have started trials with green-hay made from native plant swards and pinned down with pallets. This year we plan some trials with hydromulch. Lots of important questions remain: tussac grass can be sustainably grazed but we need to learn how other species respond to carefully managed grazing, and we need to add new species to our seedy list. There is growing (!) enthusiasm for native species across the islands and Falkland Islanders are a resourceful bunch, so the future feels bright green! Our initial trials were funded by the Darwin Initiative, and supported by RBG Kew, Stanley Nurseries, Quercus Statistical Consulting Ltd. and the Falkland Island Government. Current work is funded by the John Ellerman Foundation. Farmers and landowners across the Falklands have provided advice and allowed us access for seed collection and trials - their hospitality is unparalleled. Falklands Conservation volunteers have kindly turned out in snow and wind. Native plant seed growing on eroded clay soil treated with sheep manure, dags and natural fibre matting. A small Native Seed Hub on Cape Dolphin Farm, East Falkland. Photograph: Falklands Conservation. 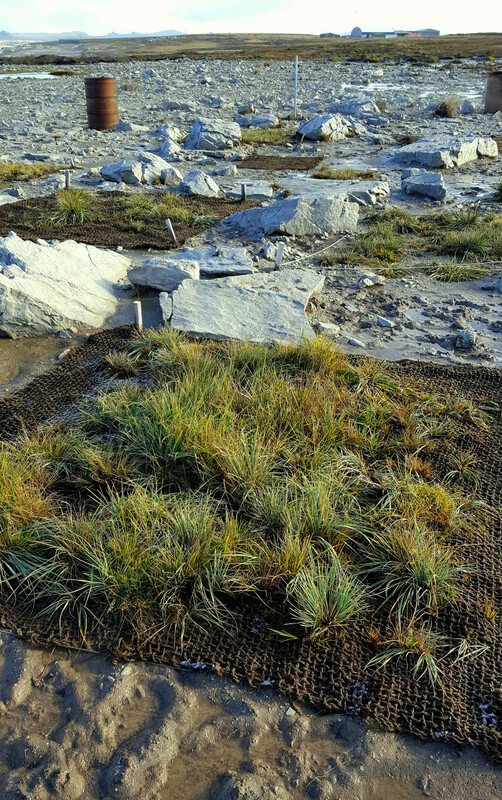 For more information on the trials described here please visit http://www.falklandsconservation.com/projects/habitat-restoration or follow us on Facebook (search Falklands Conservation) or Twitter (@FI_Conservation). 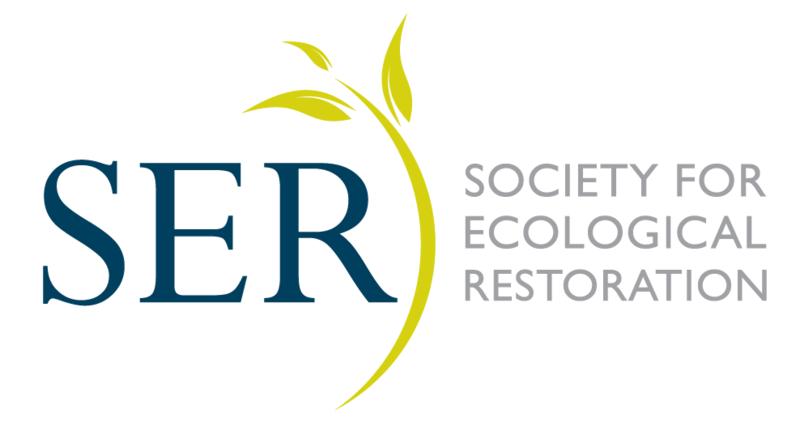 Our Habitats Officer, Frin Ross is looking forward to attending SER2017 in Brazil, please look for her - she would love to hear your ideas and advice. All of our work is funded by donations and public support you can find out about adopting a penguin or becoming a member: http://www.falklandsconservation.com/our-shop.